We offer high quality wall clocks, table clocks & station clocks in brass, wood, steel & wrought iron. 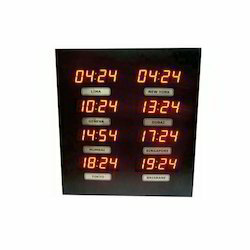 World Time Clock (5 In 1 Time) is more than just decorative accessories for your office/homes/stations and it is also a beautiful product to show you time. We produce nautical antique wall clocks with high quality raw materials. This nautical antique wall clock is 16inch in diameter. We are the leading Manufacturer & Exporter of Classic Watches. Ajinkya Electronic systems is a manufacturer of World Time Clocks that show time of any international city. 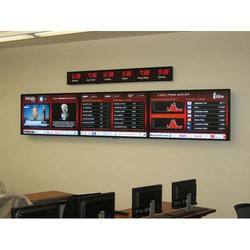 These clocks are customized for both indoor as well outdoor viewing and can be used to show times of cities in various digit sizes and colors. We are the leading manufacturer, trader, wholesaler and supplier of premium quality assortment of Wall Clocks, which is a classic fusion of ruggedness and sleek artistry. These are manufactured in our production unit by using superior quality raw material and latest technology, which is well-equipped with advanced machines. Details: Solid Brass World Time Zone Clock and Perpetual Calendar Paperweights. World Time Desktop Clocks manufacturers, suppliers and distributors in Delhi Gurgaon and noida. We also supply all over India n metro cities like Mumbai, Bangalore, Chennai, Pune, Faridabad, Kerala. We are a prominent name of the market engaged in offering exclusive Table Clock to the customers. These Table Clock are made using FRP reinforced with metal, under the expert guidance of our team of quality controllers. Moreover, we can customize these Table Clocks as per the exact details provided by the esteemed customers. World time 5 time zone roman numbers wood & brass wall clock 16"
Olies international manufacturing range includes wall clock, table clock, nautical clock, antique clock, marine clock, helmet clock, brass clock, wood clock, world globe clock and wood based antique clock.